Confident 11-year-old Luke Chacko impresses powerhouse singer and actress Idina Menzel. In an interview with Ellen Degeneres, the 11-year-old said that while he often gets bullied at school and called “gay” or “a girl”, despite the fact that it hurts, he’s able to stand strong and brush it off. The audience cheered as the adorable little boy explained that whenever someone says something negative about him, it simply comes back to them. Ellen surprised the 11-year-old by reuniting him with his idol Idina Menzel, who played Queen Elsa in Frozen. Idina explained that she asked him if maybe he wanted to sing another song instead, but being so unapologetically himself, Luke said of course he’d sing the Frozen hit. “In the last month I’ve been to a couple cities and every time a boy comes up he tells me he doesn’t really like this song. And one time even, he said he liked Trolls and he liked the Justin Timberlake song,” explained Idina to Luke. After their first meeting, Idina tweeted “You blew me away Luke. 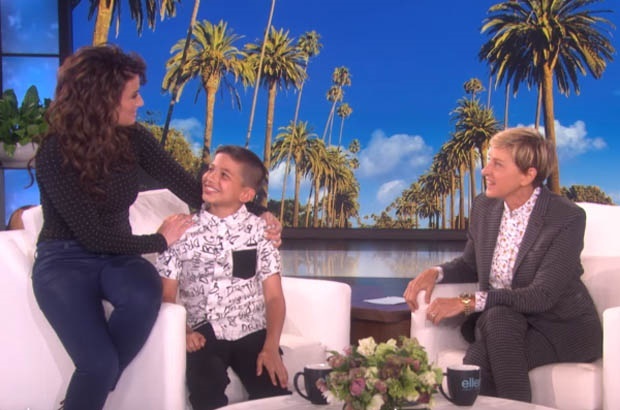 #talent #courage #chutzpah”, in awe of the 11-year-old’s voice, and was lucky enough to hear him belt out the tune once more as he sang for Ellen and her audience on her show. We’re so inspired by Luke’s courage and resilience and how he’s just not afraid to be himself. There certianly is no getting this rubber man of steel down. And with confidence, talent and Ellen and Queen Elsa herself as his friends, I think it’s safe to say we all want to be in Luke’s squad. Do you know any similarly inspiring children you'd like the Parent24 readers to know about? Tell us by emailing to chatback@parent24.com.